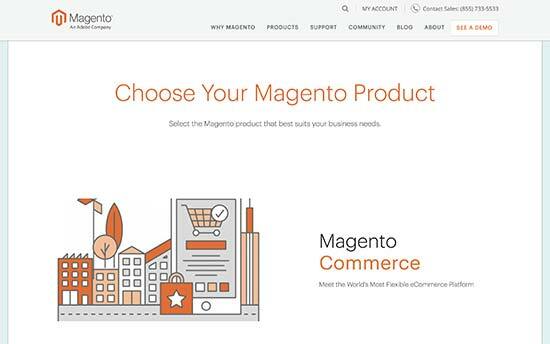 Are you trying to decide between Magento vs WooCommerce for your online store? Magento and WooCommerce are two popular eCommerce platforms on the market. In this article, we will compare Magento vs WordPress and explain their pros and cons, so you can choose the best platform for your needs. Before we get into details, let’s take a quick look at both popular eCommerce platforms and what makes them stand out. Magento is an open source eCommerce platform which allows businesses to create online stores, accept payments, and manage products. It has a community edition available for free download. It also has paid solutions which come with additional features, cloud hosting, and support. WooCommerce is an open source eCommerce platform built on top of WordPress (world’s most popular website builder). It allows you to easily create an online store, accept payments, manage inventory, and more. It runs on top of WordPress (see our complete WordPress review), which gives you access to thousands of WordPress plugins and themes to grow your eCommerce business. Both platforms are open source software, can be extended with extensions, and utilize templates for design. However, they both have different pros and cons which make them unique. If you are just starting out, then you would want to keep a few things in mind when choosing a platform. These basic factors are crucial when deciding which eCommerce solution will be better for your business. Budget – Cost of starting your store and recurring expenses that would affect your business. Payment Methods – It should support multiple payment gateways. If you require certain payment methods, then you need to make sure that it supports them. These are just some of the basic things you need to look at. Depending on your business, you may also want to consider how the platform does other things like inventory, taxes, invoices, and more. In this Magento vs WooCommerce comparison, we will review how both platforms compare on these basic requirements. For most startups, the cost is one of the most significant factors in decision making. When starting your eCommerce website, you need to evaluate the cost while factoring in how those costs will grow as you need more resources, add-ons, and other services. Magento is a self-hosted open source software. It comes in two editions. First, you have a community edition. You can download and install this yourself on any hosting provider. It does not include all features, and it does not come with any support. Second, you have Magento Commerce which includes paid plans with cloud hosting included. The pricing of these plans is not listed on the Magento website. The small business plan called Magento Commerce is available as a monthly subscription with a revenue-based license cost. Paid plans for Magento are quite expensive. They offer more value with high-performance cloud hosting, additional features, and professional support. These plans include several features that would otherwise require a paid extension. Having that said, even the Magento community version is not cheap. The core software you can download for free, but you will need at least VPS hosting plan or a cloud host like Amazon Web Services to run it. This means even though you will be using the free version, your hosting bill will still be quite higher than a shared hosting plan. If you purchase paid extensions, themes, or hire a developer to work on your Magento store, then all these will significantly increase your costs. WooCommerce is available as a free software that anyone can download and install. It runs on top of WordPress which means you can install it on any WordPress website. WooCommerce itself is free, however, you will need to register a domain name, SSL certificate, and a WordPress hosting account to start your WooCommerce store. Normally, you can buy a domain name for $14.99 / year, SSL certificate $69.99 / year, and hosting for $7.99 / month. This is cheaper than self-hosted Magento community edition but still, it is a lot of money for a startup. There are several specialized WooCommerce hosting companies that are now offering discounted hosting plans which reduce your starting cost significantly. 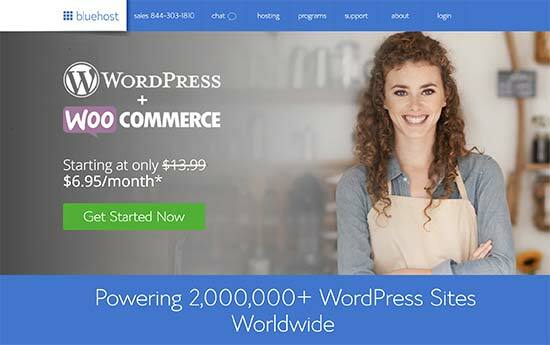 Bluehost, an officially recommended WooCommerce and WordPress hosting provider, has agreed to offer WPBeginner users free domain name, SSL certificate, and discount on hosting. This offer will help you start your online store for as low as $6.95 / month. The cost of starting a WooCommerce store is a lot lower than the Magento community edition. There are a lot more choices available for WooCommerce hosting plans than Magento, which helps you choose a plan that fits your budget. Apart from hosting, using paid extensions and themes for WooCommerce will also affect your costs. However, WooCommerce gives you access to more than 55,000+ WordPress extensions and thousands of free WordPress themes. 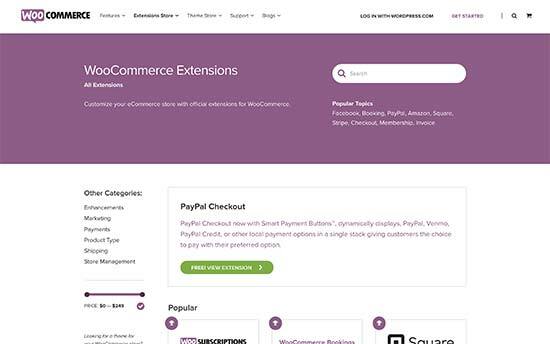 You can easily find free WooCommerce plugins as alternatives to paid extensions. There are also tons of free WooCommerce themes that you can use to further reduce your costs. With affordable hosting plans, an abundance of low cost free extensions and themes, WooCommerce is clearly less costly than Magento. Most folks starting an eCommerce business are not programmers or web developers. They need a platform that they can use easily without paying someone a fortune to help them do basic things. Even experienced users prefer an easy to use platform that helps them focus on growing their business instead of struggling with software. Let’s take a look at Magento and WooCommerce to see which one is more easy to use. Magento is a powerful eCommerce specific platform, packing tons of built-in features that work out of the box. It comes with an advanced setup process that can be complicated for new users. It is not easy to install and most hosting companies do not offer pre-configured installers for Magento. The installer language is very developer-centric which may leave beginners a bit clueless about several important settings. After the setup, you will have to spend some time learning the basics. Installing extensions or customizing themes is not always easy, and you may need to seek help to set them up. You can find tutorials and documentation online, but most often they are written for developers and not for DIY users. Overall, Magento is extremely powerful and comes packed with a ton of features, but it is not the easiest to use eCommerce platform. WooCommerce is a little easier to use compared to Magento. The installation is simple as many WooCommerce hosting providers will automatically install it for you along with WordPress. 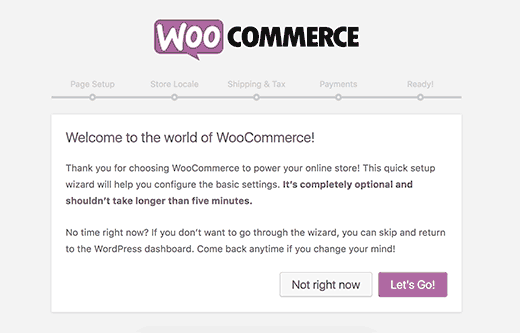 Since WooCommerce is a WordPress plugin, you will need to install WordPress first. 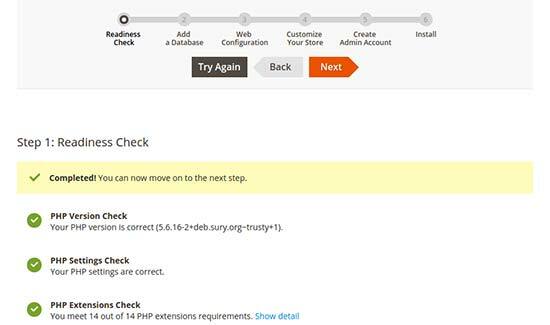 Even if your host doesn’t automatically install WordPress, chances are that there would be an auto-installer that would let you do it with just a few clicks. WooCommerce comes with a setup wizard that will walk you through initial setup like creating pages, set up payments, choose the currency, set shipping and tax options. Once you are up and running, you will find plenty of help to do almost anything. WooCommerce themes and plugins are easy to install and come with their own settings. WooCommerce still has a bit of a learning curve, but overall it is far easier to use than Magento. As an eCommerce store, you will be accepting online payments on your website. There are many payment gateway companies that allow you to accept payments on your website. Some payment gateways may not be available in all regions. You need options that are available for both you and your users. Let’s see what payment options are available to Magento and WooCommerce stores. Magento comes with PayPal, Authorize.net, cash on delivery, bank transfer, and purchase order payment methods by default. 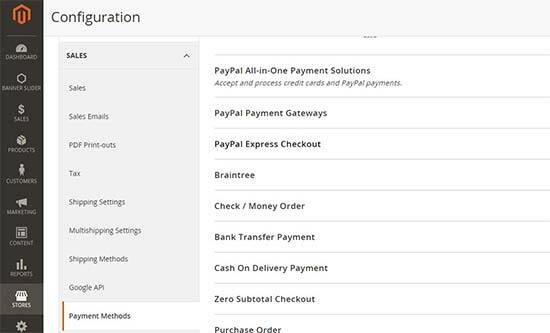 It also has extensions available for many popular payment gateways including Stripe, 2Checkout, Braintree, WePay, Google Checkout, Skrill, and more. Magento’s APIs allow developers to easily integrate payment gateways. If the payment gateway you are looking for is not yet available, then you can hire someone to create a custom extension for that. 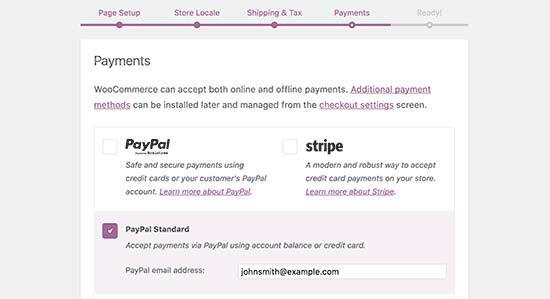 WooCommerce offers PayPal and Stripe payments by default. It also supports all major payment gateways through extensions and addons. WooCommerce even supports many regional and lesser-known payment companies. Since it is so easy to extend, any payment company can create an add-on for WooCommerce and provide support for it. We feel that both Magento and WooCommerce do an equally great job in terms of payments support. Both platforms have support for multiple payment options. There is a limit to the features your eCommerce platform can add to the core software. This leaves room for third-party extensions, tools, and integrations to extend the platform by offering additional features. Both Magento and WooCommerce have extensions, themes, and support offered by third-party integration providers. Magento has an active community of developers, agencies, and freelancers. 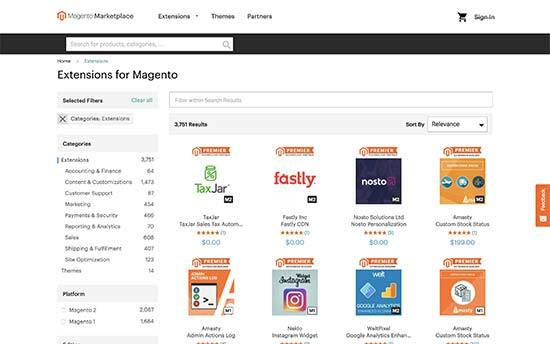 There are plenty of free and paid third-party extensions available for Magento that you can use. These extensions allow you to easily add new features and integrate other tools and services into your online store. At the time of writing this article, Magento Marketplace had 3751 extensions out of which 1182 were available for free. That’s a decent amount of extensions considering that Magento has a lot of functionality in the core. Since WooCommerce runs on top of WordPress this gives you access to more than 55,000 free WordPress plugins and thousands of paid plugins. Whether you want to add contact forms, Google Analytics, lead generation forms, or any other feature imaginable, chances are that there is already a plugin available that you can use. A large number of extensions means you can connect your WooCommerce store to any third-party service like your email marketing company, CRM software, payment gateways, and more. Growing your eCommerce business comes with its own challenges. As your website traffic and sales grow, you will need more server resources to keep up with your business goals and growth trajectory. Both Magento and WooCommerce can handle large eCommerce stores with huge spikes in traffic. However, they are two different platforms which affect their scalability and infrastructure requirements. Let’s take a look at how Magento and WooCommerce handle scalability on large eCommerce websites. Magento is designed from the ground up to be a robust eCommerce platform. However, when it comes to scaling, your costs and technical challenges will skyrocket. If you are using the community edition of Magento, then you will have to do it on your own. Magento is a resource intensive software, which means if you are on a VPS hosting, then you will have to upgrade to a dedicated server and then to a cloud hosting service like Amazon Web Services. You will also need to optimize your store for caching, manage backups, protect against DDOS attacks by using a website firewall, and more. If you don’t have experience in managing large websites, then you will need to hire Magento specialists. If your business can afford the growing costs, then the easier option would be to switch to Magento’s paid business and enterprise plans. WooCommerce stores will face the same technical challenges as Magento. However, the good thing is that you have a lot more options to continue growing while keeping your costs low. First, you have several easy caching options to improve performance which can be implemented even by beginners. This will keep your server resources low and allow you to continue growing for a while. Next, you can move to managed WordPress hosting providers like WPEngine or Liquid Web. These concierge WordPress hosting companies allow you to easily scale your website to meet your growing business. Finding WordPress specialists to help scale your online store is not as costly as Magento. Even at the enterprise level, your eCommerce store would be able to perform well at much lower costs. 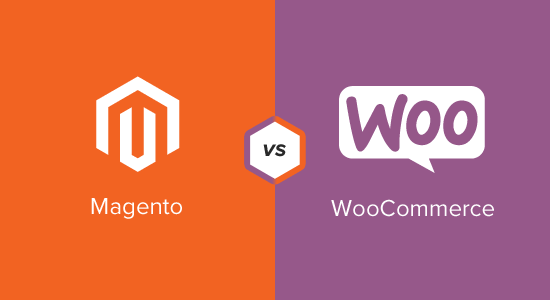 Magento vs WooComemrce – Which One is a Better E-commerce Platform for You? Magento and WooCommerce are both full-featured eCommerce platforms that you can use to build any kind of online store. However, it comes down to costs, and your personal skills to choose between them. WooCommerce obviously has the advantage of a large user base and market share. It runs on WordPress which is already the world’s most popular website builder. WordPress users would feel at home when working on WooCommerce. It also beats Magento in terms of ease of use, and cost of building and running an eCommerce store at scale. If you want an easy to use, cost-effective, and easy to scale eCommerce platform, then WooCommerce is the perfect fit for you. Magento, on the other hand, is more suitable for enterprise-level businesses with their own development teams or businesses who can spend money on hiring someone. We hope this article helped you compare the pros and cons of Magento vs WooCommerce. You may also want to see our side-by-side comparison of Shopify vs WooCommerce.